The Lake Boga Flying Boat Museum is located on a foreshore site which was part of the World War II RAAF Flying Boat Repair Depot. 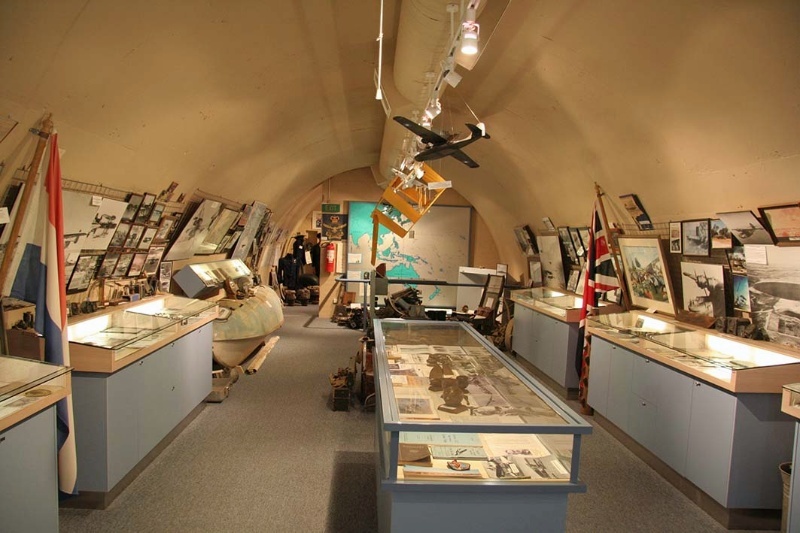 It features an original communications bunker, slipways, a Catalina flying boat of the type which was serviced and repaired there during the War, and a collection of related artefacts. Flying boats were an important component of the RAAF war effort. The Catalina aircraft, which was first produced in the US in 1939, was quickly adopted by many of the allied forces, and formed the backbone of the RAAF flying boat fleet. Although it had a low top speed for a fighting aircraft, it also had outstanding load carrying capacity and endurance and was extremely robust. It was deployed extensively in the western Pacific for bombing, reconnaissance, supply drops and rescue missions. The RAAF placed its first order for 18 PBY-5 Catalina flying boats in 1940. The first RAAF flying boat operations started in January 1942 with a raid by Catalinas from a base in Port Moresby. From April 1943 specialized RAAF Catalina squadrons, known as 'Black Cats', flew long distance night-time mine-laying missions which effectively disrupted Japanese shipping). The USAF deployed similar squadrons, also known as the 'Black Cats'. Following Japanese air attacks on northern Australian towns in early 1942, northern bases and the main flying boat base at Rathmines on Lake Macquarie in NSW were considered vulnerable, and the Department of Air decided to build an inland RAAF flying boat repair depot. Qantas Empire Airways had already established an emergency base at Lake Bogain anticipation of a possible threat to its Rose Bay Sydney base. This site had a number of advantages - the lake was clear of obstructions, with flat surrounds, and aircraft could take off from the lake in any direction. The site was serviced by a railway, and power was available from Swan Hill, which also had an aerodrome. The first personnel arrived in late June 1942. Open fronted 'grandstand' hangars, workshops and stores buildings were established on concrete aprons around a curve on the foreshore, serviced by two concrete slipways, with a central timber fuelling jetty. Moorings buoys were set up in a long arc around the lake. The concrete semi-underground radio communications building was located in a central open area in front of the hangars. A similar bunker for VHS radio transmission was located on higher ground to the southwest of the town. At first personnel were accommodated at Swan Hill, but an RAAF barracks and WAAAF quarters were established at the western end of the Lake Boga township by the end of 1942. The first RAAF Catalina arrived at the Lake in July, and the first repaired Catalina took off in September. The base also serviced flying boats from the Royal Netherlands East Indies Air Force and US forces. In all, 416 aircraft were serviced and repaired at the base, including Catalinas, Dorniers, Kingfishers, Short Sunderlands, Supermarine Walruses and Martin Mariners. Catalinas were the only aircraft to see service with the RAAF for the entire wartime operations, and 168 were acquired by the RAAF. After the Japanese surrender, Catalinas were used to ferry home ex-prisoners of war, as well as servicemen from Borneo, New Guinea and the islands. The Lake Boga base was closed in 1947, when the majority of buildings were removed. The concrete radio communications bunker and two slipways remain on the foreshore site, along with a reconstructed PBY Catalina. 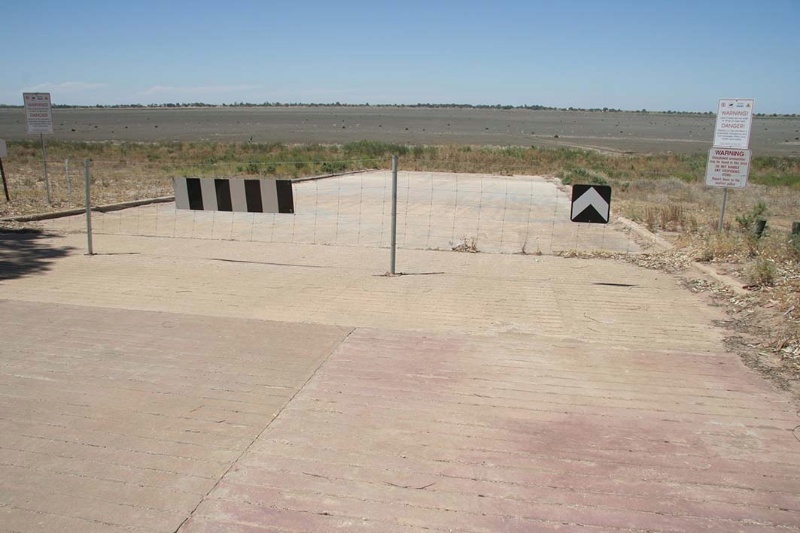 Elsewhere on the former base there are remains of the concrete aprons and footings from the hangars and maintenance sheds, a concrete emergency generator house and remnants of posts and earthworks from the original perimeter fence. The VHF radio communications bunker and scattered evidence of the former barracks area remain to the west of the town. A playing field now occupies the site of the parade ground. The Lake Boga Flying Boat Museum site is of historical significance for its rarity as part of the only dedicated flying boat repair base which operated in Australia during World War II, and as part of the only inland flying boat base operating in Australia during that conflict. The Lake Boga Flying Boat Museum site is of historical significance as a component in the flying boat operations of the RAAF, which made an important contribution during the Allied conflict with Japan. The Catalina aircraft on the Lake Boga Flying Boat Museum site is of historical significance for its rarity as one of only a few remaining examples of this important wartime aircraft in Australia. 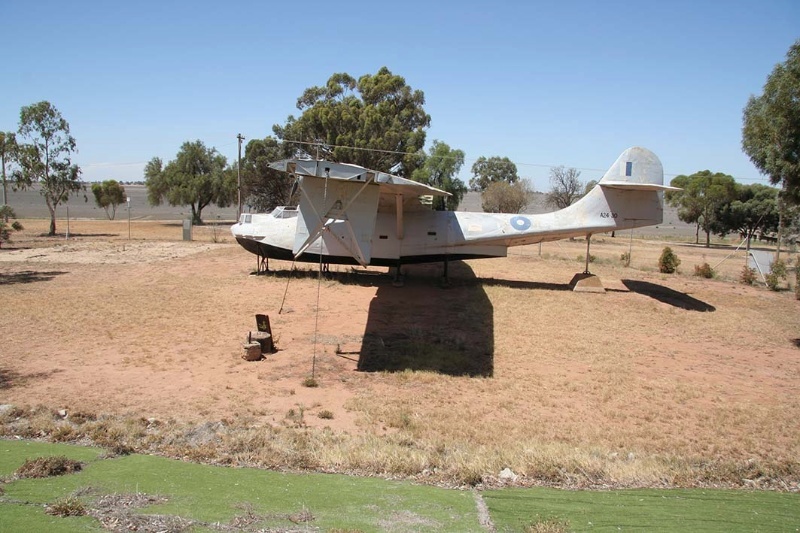 The Lake Boga Flying Boat Museum site is of historical significance for its capacity to demonstrate the features of an RAAF base established under the difficulties and contingencies of wartime, in contrast to the more formal and self-contained bases established before World War II. The Lake Boga Flying Boat Museum site is of historical significance for its connection with important missions and battles during World War II. Aircraft which participated in those events were serviced at the base. 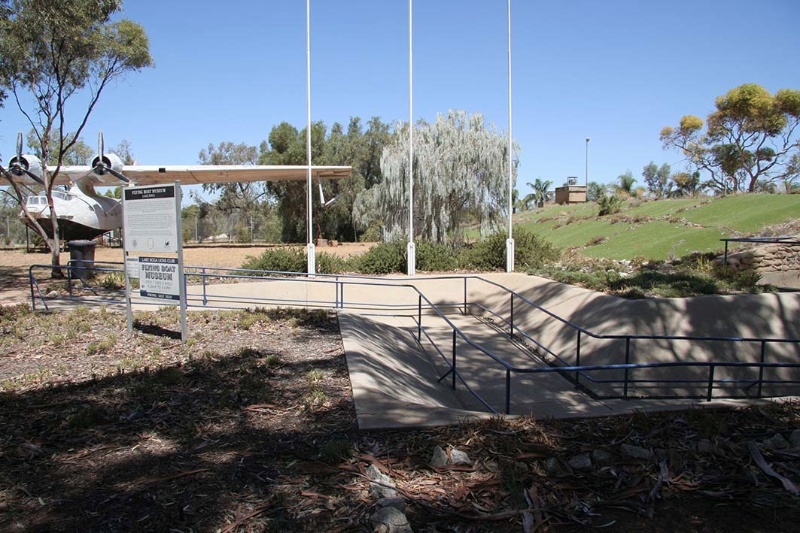 The Lake Boga Flying Boat Museum site and collection is of social significance for its associations for RAAF and WAAAF personnel and their families, and for the local community which was involved in the establishment and activities of the base. 1. All the land marked L1 on Diagram 2208 held by the Executive Director being all of the land described in Certificate of Title Volume 9025 Folio 006 and part of the land described in Certificate of Title 8517 Folio 988 and part of Crown Allotment C Parish of Boga. 2. All of the building marked B1 and the concrete ramps marked F1 and F2 on Diagram 2208 held by the Executive Director. The Australian and Allied aircraft which were repaired at the RAAF Flying Boat Repair Depot at Lake Boga made a significant contribution to Allied operations in the Pacific during World War II. General Conditions: 1. All exempted alterations are to be planned and carried out in a manner which prevents damage to the fabric of the registered place or object. General Conditions: 2. Should it become apparent during further inspection or the carrying out of works that original or previously hidden or inaccessible details of the place or object are revealed which relate to the significance of the place or object, then the exemption covering such works shall cease and Heritage Victoria shall be notified as soon as possible. Note: All archaeological places have the potential to contain significant sub-surface artefacts and other remains. In most cases it will be necessary to obtain approval from the Executive Director, Heritage Victoria before the undertaking any works that have a significant sub-surface component. General Conditions: 3. If there is a conservation policy and plan endorsed by the Executive Director, all works shall be in accordance with it. Note: The existence of a Conservation Management Plan or a Heritage Action Plan , Heritage Victoria provides guidance for the management of the heritage values associated with the site. It may not be necessary to obtain a heritage permit for certain works specified in the management plan. General Conditions: 4. Nothing in this determination prevents the Executive Director from amending or rescinding all or any of the permit exemptions. General Conditions: 5. Nothing in this determination exempts owners or their agents from the responsibility to seek relevant planning or building permits from the responsible authorities where applicable. Regular Site Maintenance : The following site maintenance works are permit exempt under section 66 of the Heritage Act 1995: a) regular site maintenance provided the works do not involve the removal or destruction of any significant above-ground features or sub-surface archaeological artefacts or deposits; b) the maintenance of an item to retain its conditions or operation without the removal of or damage to the existing fabric or the introduction of new materials; c) cleaning including the removal of surface deposits, organic growths, or graffiti by the use of low pressure water and natural detergents and mild brushing and scrubbing; d) repairs, conservation and maintenance to plaques, memorials, roads and paths, fences and gates and drainage and irrigation. e) the replacement of existing services such as cabling, plumbing, wiring and fire services that uses existing routes, conduits or voids, and does not involve damage to or the removal of significant fabric. Note: Surface patina which has developed on the fabric may be an important part of the item's significance and if so needs to be preserved during maintenance and cleaning. Note: Any new materials used for repair must not exacerbate the decay of existing fabric due to chemical incompatibility, obscure existing fabric or limit access to existing fabric for future maintenance. Repair must maximise protection and retention of fabric and include the conservation of existing details or elements. Fire Suppression Duties : The following fire suppression duties are permit exempt under section 66 of the Heritage Act 1995, a) Fire suppression and fire fighting duties provided the works do not involve the removal or destruction of any significant above-ground features or sub-surface archaeological artefacts or deposits; b) Fire suppression activities such as fuel reduction burns, and fire control line construction, provided all significant historical and archaeological features are appropriately recognised and protected; Note: Fire management authorities should be aware of the location, extent and significance of historical and archaeological places when developing fire suppression and fire fighting strategies. The importance of places listed in the Heritage Register must be considered when strategies for fire suppression and management are being developed. Weed and Vermin Control : The following weed and vermin control activities are permit exempt under section 66 of the Heritage Act 1995, a) Weed and vermin control activities provided the works do not involve the removal or destruction of any significant above-ground features or sub-surface archaeological artefacts or deposits; Note: Particular care must be taken with weed and vermin control works where such activities may have a detrimental affect on the significant fabric of a place. Such works may include the removal of ivy, moss or lichen from an historic structure or feature, or the removal of burrows from a site that has archaeological values. Public Safety and Security : The following public safety and security activities are permit exempt under section 66 of the Heritage Act 1995, a) public safety and security activities provided the works do not involve the removal or destruction of any significant above-ground structures or sub-surface archaeological artefacts or deposits; b) the erection of temporary security fencing, scaffolding, hoardings or surveillance systems to prevent unauthorised access or secure public safety which will not adversely affect significant fabric of the place including archaeological features; c) development including emergency stabilisation necessary to secure safety where a site feature has been irreparably damaged or destabilised and represents a safety risk to its users or the public. Note: Urgent or emergency site works are to be undertaken by an appropriately qualified specialist such as a structural engineer, or other heritage professional. Signage and Site Interpretation : The following Signage and Site Interpretation activities are permit exempt under section 66 of the Heritage Act 1995, a) signage and site interpretation activities provided the works do not involve the removal or destruction of any significant above-ground structures or sub-surface archaeological artefacts or deposits; b) the erection of non-illuminated signage for the purpose of ensuring public safety or to assist in the interpretation of the heritage significance of the place or object and which will not adversely affect significant fabric including landscape or archaeological features of the place or obstruct significant views of and from heritage values or items; c) signage and site interpretation products must be located and be of a suitable size so as not to obscure or damage significant fabric of the place; d) signage and site interpretation products must be able to be later removed without causing damage to the significant fabric of the place; Note: The development of signage and site interpretation products must be consistent in the use of format, text, logos, themes and other display materials. Note: Where possible, the signage and interpretation material should be consistent with other schemes developed on similar or associated sites. It may be necessary to consult with land managers and other stakeholders concerning existing schemes and strategies for signage and site interpretation. Minor Works : Note: Any Minor Works that in the opinion of the Executive Director will not adversely affect the heritage significance of the place may be exempt from the permit requirements of the Heritage Act. A person proposing to undertake minor works may submit a proposal to the Executive Director. If the Executive Director is satisfied that the proposed works will not adversely affect the heritage values of the site, the applicant may be exempted from the requirement to obtain a heritage permit. If an applicant is uncertain whether a heritage permit is required, it is recommended that the permits co-ordinator be contacted. 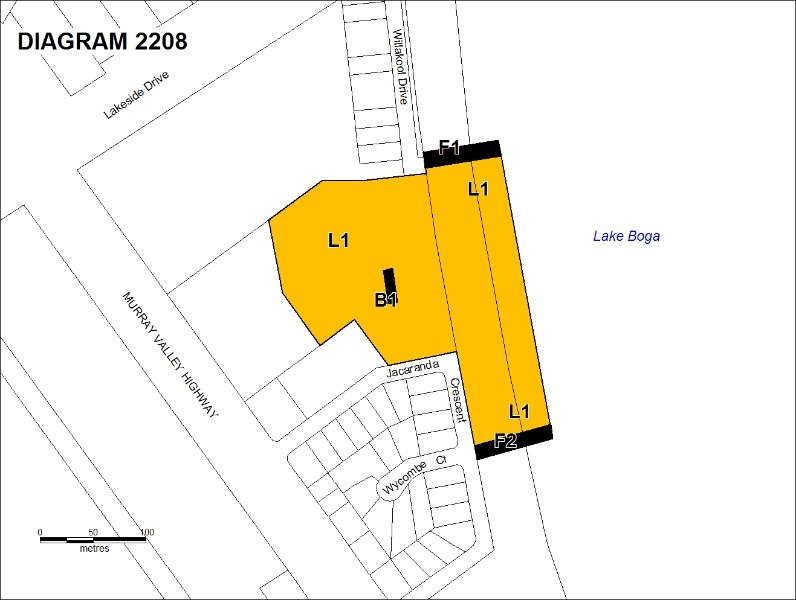 The visual relationship of the site to the lake is of primary significance and any new development along the immediate foreshore will be subject to a permit application. It is recommended that before a permit is issued, Aboriginal Affairs Victoria should be contacted to ascertain whether or not the activity requires a Cultural Heritage Management Plan under the Aboriginal Heritage Act 2006. Permit exemptions policy for heritage objects: Permit exemptions will only be granted where the incorporated and community based organisation with responsibility for the registered heritage object or collection has developed a Conservation Management Policy [CMP] for the object, and that CMP has been endorsed by the Executive Director. Once an endorsed CMP has been implemented, the object type may be subject to a review to enable a class of standard, or specific, permit exemptions to be granted.